Next Article Do you have photos of the Charlton Park prefabs? Reads to me like they’re opening a specific cycle studio and moving all the exercise bikes into it. This will let them run back-to-back group cycle sessions (spin classes or similar presumably), and free up more time for other classes in the main space. 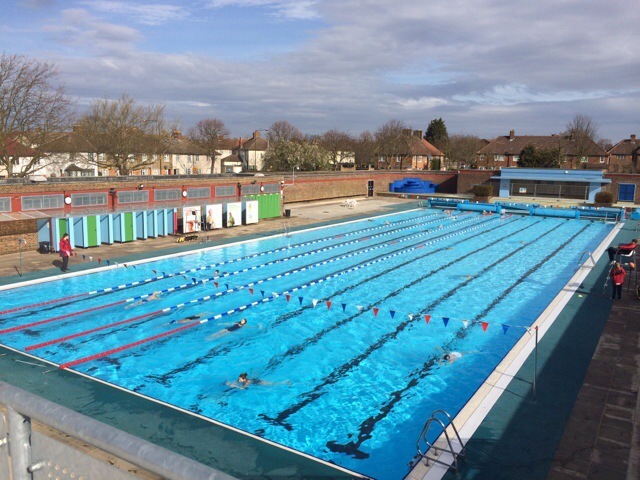 The pool is open until 7.30 pm weekdays now. They are converting the old reception area into a cycle studio. Just hope the pumping music doesn’t go on all day long (obviously will at class times) as don’t want my swim ruined by it! Good to see the lido really busy over the weekend. It’d be nice if they’d open an hour earlier on a Saturday/Sunday to give people a chance to have a proper swim before the swim clubs and lessons start – and maybe a bit later in the evening (a longest-day evening swim would have been nice). Overall, though: hoorah for swimming outdoors in the sunshine! Hello all: Anyone know what times the kid’s splash pool is always open? I saw in a tweet that it was only an hour at lunch time? Is that really true? I’ve got two tiny ones and it’s ideal for them, but the big pool is much too huge. Any thoughts on exactly when the little pool is open? Thank you. Thanks for all that. That seems a bit bonkers. Basically the kids pool is open one hour a day – the hour most kids will be eating lunch. It this perhaps something that The Friends of the Lido can raise? I’ll phone them to confirm that’s the correct time. The baby pool wasn’t open between 12 -1 (sunny weekday) when I was there recently. The problem seems to be to organise/pay for an additional lifeguard. So I assume it closes over lunch at weekends as some of the staff they do have on duty are on lunch then?! Not good. Lots of babies on sunny days in the main pool. Even swim nappies leak (and not convinced all babies are wearing special swim nappies either) and I had a moan and asked them why they can’t open their excellent baby/ ‘training pool’ as it’s far better (sic..) for all concerned. I’d be unhappy about taking a baby of mine into the main pool. I get the impression that opening hours for the baby/training pool may be more generous in the school holidays, but not before or after, even in sunny weather. I also asked why they couldn’t open ± 8am – 6.30pm on weekends, only to be told that it was company policy to only open 9 – 5 at weekends. Other than that, the pool’s a big success and hope it stays open year round. yes, agree. Must be a cost/staffing issue. Even 8 – 6 would be good. I’ve been there at 9am on a sunny weekend day to find a queue to get in. Is that Friends of CL still active and can they get any answers from Lido management? I just ask ad hoc qs of whoever is on the desk when I go through.